It’s been a fair old while since I’ve added a new post to the blog. This is largely due to the fact I’ve recently started a new job, which of course has taken up most of my attention over the past few weeks. Since I was enjoying having a lazy Sunday, I though I should probably do at least something a little productive so I made some lovely mint sauce as a nice accompaniment to the lamb we’re having! Mint has to be one of my favorite herbs, so mint sauce has been on my hit list for a long while. I used to buy the stuff in jars which I always loved – especially the sharpness of the vinegar you always get with mint sauce. This sauce goes very well with lamb, of course. However, in my opinion mint sauce is great with lots of other dishes too. I think this particular mint sauce would be worth trying with new potatoes and even white fish. You can easily throw this together in around five minutes. Given how easily mint grows in the garden, you’ll never be without mint sauce when the shops shut on a Sunday afternoon ever again! Check out this useful page that has a few does and don’ts for growing it yourself! We have some mint in the garden, but this time I had to cheat I’m afraid so I bought some from the shops. Ours had gone to flower, and I wasn’t sure whether or not that was safe to eat – so I erred on the side of caution! 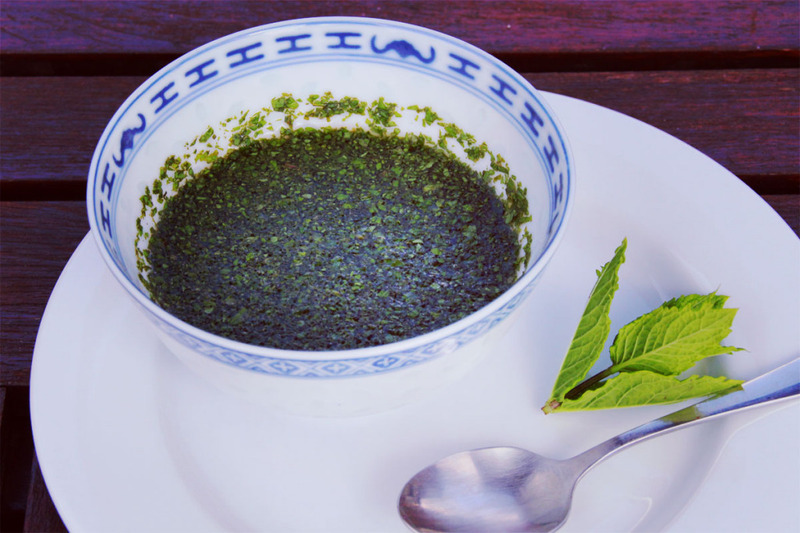 This mint sauce is a perfect accompaniment for lamb on a lazy Sunday. Remove the mint leaves from their stalks. Discard the stalks. Sprinkle a little salt over the mint leaves and finely chop. Put the mint leaves into a bowl and add the caster sugar. Add the boiling water, pouring over the mint so to start dissolving as much of the caster sugar as possible. Stir until well mixed and all the sugar is dissolved. Leave covered in the fridge until ready to serve.